This is our Sweet Basil Steam Distilled Essential Oil. 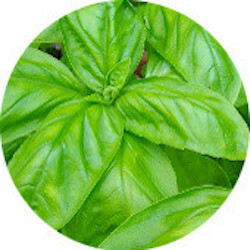 Herbal Folk Traditional uses for Sweet Basil include asthma, bronchitis, calm the nerves, colds, coughs, emphysema, fever, flu, improve blood circulation, improve digestion, insect bite antidote, irritable skin complaints, kidney ailments, malaria, poisonous snake bite antidote, stomach ailments, rheumatic pain. Sweet Basil essential oil is a beautiful annual that has simple white flowers and has a long history of both culinary and medicinal uses! It has an herbaceous uplifting scent with rich balsamic undertones. Sweet Basil blends well with Bergamot, Black Pepper, Cardamom, Citronella, Clary Sage, Coriander, Geranium, Hyssop, Lavender, Lime, Marjoram, Melissa, Neroli, Oakmoss, Orange, Peppermint, Rosemary, Sandalwood, Spearmint, Verbena, Ylang Ylang and other "green" notes. Our Sweet Basil essential oil is cultivated organically and steam distilled from the blossoms and plant. Sweet Basil Essential Oil is used in aromatherapy and natural perfumery such as for dental products, fragrances and soap. Sweet Basil Essential Oil has the following actions: adrenal stimulant, antidepressant, antiseptic, antispasmodic, carminative, cephalic, digestive aid, emenagogue, expectorant, febrifuge, galactagogue, nervine, prophlylactic, restorative, stomachic and tonic. Shelf life is 3 years and 8 months or more.